No doubt about it … heinous, horrific crimes occasionally take place in Travis County. When they do, Rick Reed understands and respects the pain felt by the victims’ friends and family members. 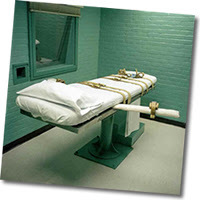 But Rick Reed also believes the procedure of strapping human beings to a table and injecting them with a chemical cocktail that anesthetizes them, paralyzes them and then sends them into cardiac arrest, is never an acceptable way for a civilized society to respond to the crimes those human beings committed. Especially when we consider the fact that some of the persons strapped to that table may not have committed the crime for which they are being executed. Rick Reed wants to make one thing very clear — under his leadership, the Travis County District Attorney’s office will not seek the death penalty in any case. Why not? A 1991 study of capital punishment in Texas found that the costs associated with a death penalty case amounted to more than $2.3 million. But the cost of housing a prisoner in a Texas maximum-security prison single cell for 40 years was $750,000. In 2005, the Texas State Legislature approved “Life without Parole” as a sentencing option in capital murder cases. Just because we have the right to pursue a lethal injection, does not mean it is the right thing to do. Read more about Rick Reed’s smarter and more progressive stance on the issue of capital punishment.